Embrace your changes with a de-LIGHT-full attitude. Change is meant to help us transform our being into a stronger, better & wiser version of ourselves. It’s meant to assist our awakening & evolving into an even more beautiful expression of our selves & our souls. Therefore, change needs to be accepted with de-LIGHT, joy and love, believing and trusting in our journey. It may not always be easy, but change is a Divine purpose, to help heal us from the past or past lives, and move us into a more beautiful expression of our truth and authenticity. Metamorphosis in the Human fashion can be a challenge, yet we are meant to embrace it and learn the lessons with joy, moving into new heights. The nature of the butterfly already inherently knows how to change from the caterpillar. We as humans also instinctually know how to change as the wisdom already exists within us. We need to choose to look within, become aware and accept what needs to change, so we can transform an aspect we no longer require or wish to have as a trait. Many characteristics we have been born with are meant for our survival, yet also as a lesson for growth. We may have come into this world with a certain personality trait, fear or aspects, or acquired one during this lifetime, which is not necessarily attractive, yet, is there to help us understand our lives, and life in general, while allowing us to modify or release it. These traits, fears and aspects are all part of the inherent wisdom within us which is part 0f our soul mission for awakening and transformation. We are meant to learn about this characteristic, to recognize and accept it within ourselves and others, realizing it on a deeper level to feel, deal and heal. Acceptance leads to adjustment, understanding, healing and releasing, allowing us to become an even better version of ourselves. Choosing to change, we can transform ourselves each time we recognize an aspect of this trait may be surfacing again, leading us into deeper transformation, where this trait no longer appears in reaction to a situation. Since, we have chosen to completely release it, it leads us into a different reaction, one which may need review for transformation, or one which suits us much better for the rest of our lives. For instance, if we are quick to judge, we may find it causes relationship problems. Judgement can lead to misunderstandings on both sides of a conversation. Misunderstandings can escalate causing disruption and dissension in our lives. However, if we look at why we are judging someone, we can recognize, accept and understand the reasoning behind it. If we have judged someone as being too overbearing, perhaps the underlying reason is we ourselves are fearful of exerting our own inner truths, or maybe we haven’t created sufficient boundaries where we feel strong enough to compassionately deal with certain people. This can lead to discovering why we do not feel strong enough. Maybe we don’t feel strong enough because an adult in our lives would not allow us to speak up. This certainly caused a disruption in life. This one situation may have caused us to judge others for speaking their truth, where we felt we were not allowed to do so. Looking deeper and deeper into any trait will help us get to the root cause, leading to the understanding. The understanding leads us to being able to feel the feelings we buried, which then allows the healing and releasing. And, then we can cultivate strength and courage in speaking our inner truth without feeling we aren’t allowed to speak up. It can be a struggle to let go of certain ideas, beliefs and opinions we have either been born with or have learned through life. It is difficult to look within and determine the root causes because they can bring up old feelings which do not necessarily feel very good. Yet, these life struggles help cultivate our strength & courage, our inner power, to guide us to healing and transforming into fulfilling lives, happily recognizing & accepting the shining Soul Light within. Thus, we can live more fully into our soul missions. During our human lifetimes we shift into new phases of life, which is in essence change. We are born and change as we grow, learning along the way to communicate, care for ourselves and understand life. As we grow older, the learning, understanding and growing does not stop. In adulthood, growth is deeper awareness and understanding of ourselves. It’s becoming more open to tackle what needs to be healed, helping us evolve into the fullest expression of our unique human manifestation of the Divine. Each of us is unique and perfect in the stages of life we find ourselves in this moment, with the wisdom & knowledge we have experienced thus far, to use for the continuation of our souls’ journeys and missions, assimilating what we need for our next situation, experience or lifetime. 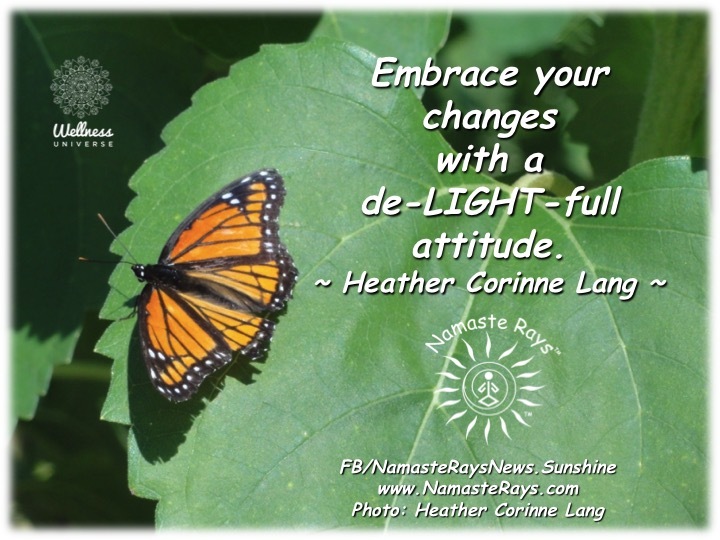 Be de-LIGHT-ed you can transform into a brighter, happier and more fulfilling version of you.